The nation continues to grieve with the community of Newtown, Connecticut over the attack that stole the lives of dozens of innocent children and teachers. What happened was evil that most of us will never understand. Since then, some elites in Washington have used the Newtown tragedy for political leverage to reignite the gun control debate. Since the beginning of the year, we have seen a number of extreme proposals from the Senate and 23 executive edicts from the President. Not one of these proposals would have changed the outcome of the tragedy in Newtown. What they will do is redline the Constitution and bruise our right to bear arms which is guaranteed by the 2nd Amendment. Make no mistake--these proposals advocate for more government control not more gun control. I believe in the sanctity of the Constitution. The Bills Of Rights were designed to protect citizens from an oppressive government. This timeless document has guaranteed freedom for Americans for over 200 years; it is certainly not up for negotiation now. Those who believe that more gun control will end violence should examine the evidence. Mexico, for example, has outlawed guns completely, but there has not been a decline in gun-related deaths. Chicago and Washington, DC have some of the toughest gun laws in America, but they are also two of the most dangerous cities in America. So, what now? The focus of any discussion or action should not be on the gun, but on the shooter. In my previous life as a judge and prosecutor in the Harris County courtrooms, I never saw a gun tried for a crime. That’s because we hold the shooter accountable, not an inanimate object. And, yet here in Congress, we have legislators advocating for more restrictions on guns while they have the protection of armed guards at every door in the Capitol – hypocrisy at its highest. 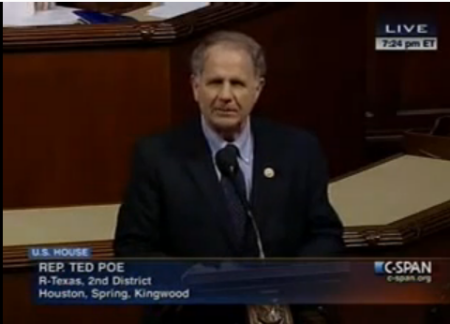 You can also view my speech I recently gave on the House floor. Click here to watch. How do you feel about the current proposals on gun reform? Share your thoughts on the survey to the right and visit poe.house.gov to send me an email. I am a staunch supporter of the Second Amendment, and I will continue to defend our constitutional right. More laws amount to more control - not more effectiveness. And more laws mean less liberty. And that’s just the way it is. cause of "National" unconstitutional gun legislation. that they have no right to regulate guns in their state, they are in fact giving sanction to the Incorporation Doctrine; the ability of the Federal Government to unconstitutionally extend the Bill of Rights onto the states. All this unconstitutional Federal attention given to anything that has to so with guns will ultimately lead to “National” gun legislation being implemented and enforced across all fifty states. The Incorporation Doctrine is exactly why the Federal Government is allowed to unconstitutionally dictate to the states whether or not they can have God, the Ten Commandments, or Bible scriptures displayed in there public buildings; it is the main weapon used by the Federal to strip the states of their sovereignty. can tell you why. It is because we are no longer a Republic based in Federalism and limited Government; we are simply a Nation based in collective Socialism.